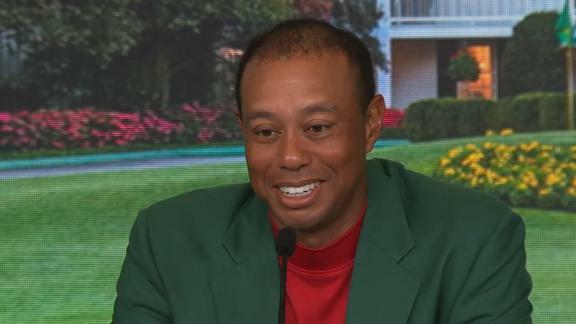 Tiger Woods reflects on what it means to win his fifth Masters, saying that it's a tournament he will never forget. AUGUSTA, Ga. -- The roars were loud and earth-shattering -- and not just on the course. There was Tida Woods, inside the Augusta National clubhouse, screaming at the television, nervous energy and anticipation consuming the room while her son was attempting to finish the most improbable of major championship victories. There were her grandchildren -- Tiger Woods' daughter, Sam, and son, Charlie -- waiting behind the 18th green, their trip to one of the game's most historic sites about to be rewarded with a Masters triumph that few dreamed possible. 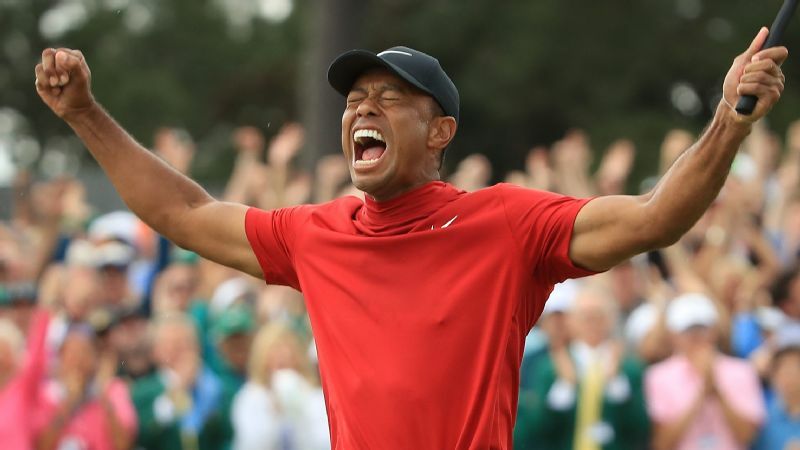 Woods had a shot to spare on the final hole, as he tapped in for a bogey that wrapped a final-round 70 and a one-stroke victory over Brooks Koepka, Dustin Johnson and Xander Schauffele and produced his 15th major title -- 11 years after the previous one -- and fifth green jacket. "Just unreal, to be honest with you,'' Woods said. "Just the whole tournament has meant so much to me over the years. Coming here in '95 for the first time and being able to play as an amateur. Winning in '97 and then come full circle 22 years later, to be able to do it again. And just the way it all transpired today. 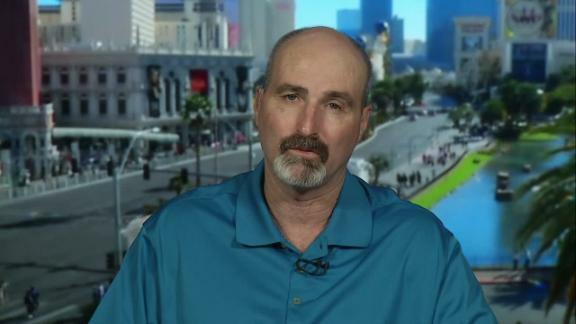 "There were so many different scenarios that could have transpired on that back nine. There were so many guys who had a chance to win. Leaderboard was absolutely packed, and everyone was playing well. You couldn't have had more drama than we all had out there, and now I know why I'm balding. This stuff is hard. It would be difficult for anyone to forget a tournament littered with big names and conquered by a player who endured so much. For the first time in his career, Woods overcame a third-round deficit to win a major, making three birdies in his final six holes to overcome 54-hole leader Francesco Molinari and hold off a late charge by Johnson and a final push from Koepka to win. Woods passed Arnold Palmer with his five Masters wins, surpassed only by Jack Nicklaus' six. The victory evoked some of the emotion the Golden Bear provided 33 years ago, when he won the Masters at age 46. Woods, at 43, became the second-oldest champion. 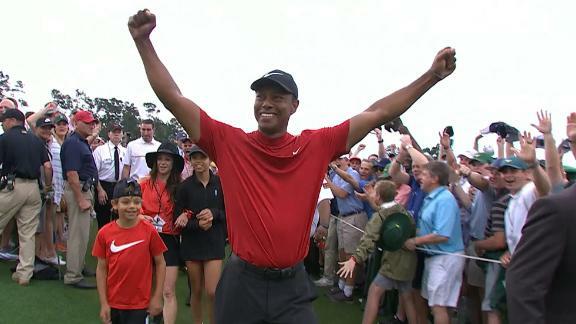 Woods now has won 15 major championships, second only to Nicklaus' 18. When Woods reached 14, it seemed a foregone conclusion that he would cruise past Nicklaus. But personal problems and four back surgeries derailed his momentum. 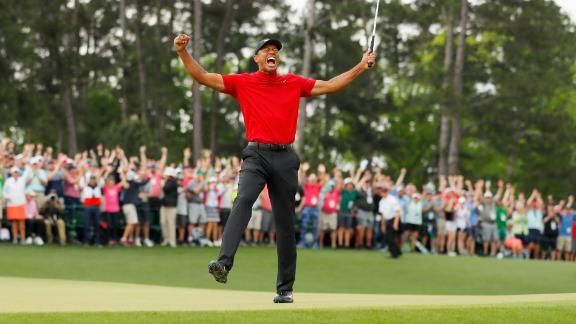 "I think this is one of the best sports stories we've ever seen,'' said Trevor Immelman, who won the 2008 Masters, in which Woods finished second, the closest he had been to victory since his win in 2005. "When I was coming through the ranks and he was at the height of his game, you always got the feeling that he knew he was the best, you knew he was the best, and that's just the way it is. The stressful, emotional, exhausting day was made even more so for Woods by an early wake-up call due to impending storms that pushed up tee times more than five hours on Sunday. With all of his back problems, Woods goes through a lengthy process to get ready to play any competitive round of golf. That paled in comparison to the treacherous comeback Woods endured in recent years as he tried to recover from multiple surgeries. The most recent of those was almost two years ago, just two weeks after Woods attended the annual Champions Dinner at Augusta National, needing a pain-killing shot just to make the trip. So frustrated with his situation was Woods that he confided in a few past champions that he thought his career was over, that he'd never play competitive golf again. "I had serious doubts after what transpired a couple years ago,'' he said. "I could barely walk. I couldn't sit. Couldn't lay down. I really couldn't do much of anything. Luckily, I had the procedure on my back, which gave me a chance of having a normal life. But then all of a sudden, I realized I could actually swing a golf club again. The victory was the 81st of his PGA Tour career, one shy of the record held by Sam Snead. It was his first major title since he won a playoff over Rocco Mediate at the 2008 U.S. Open. Woods began the day in the final group, two strokes behind Molinari, the reigning Open champion who fought through a Sunday pairing with the red-clad Woods at Carnoustie to hoist the Claret Jug. He did so without making a bogey. It looked very much the same on Sunday, as Molinari ran his streak without a bogey to 49 holes before finally making a couple of mistakes. Through 11 holes, Woods trailed Molinari by two strokes, with the likes of Schauffele and Koepka still in the mix and Jason Day and Patrick Cantlay also making runs. But Molinari's hitting his tee shot into the water at the 12th changed everything, giving Woods the opening he needed. Molinari made a double-bogey, and Woods parred, and they were tied with six holes to play. Koepka also hit his tee shot in the water at 12. Woods made birdies at the 13th and 15th holes to take the outright lead on the final day of the Masters for the first time since his victory in 2005. Then came what was perhaps his shot of the tournament, a perfect 8-iron at the par-3 16th -- where two aces were made Sunday -- that landed on a slope and trickled down toward the cup, sliding just past the hole. He made the 4-footer for birdie and a two-shot lead. A perfect drive at the 17th led to an easy par, and then the telling tee shot at the 18th with a 3-wood up the right side put Woods in position to close out a remarkable victory, though he missed the green and had to sweat out a pitch shot that set up the two-putt bogey and a final tally of 275, 13 under par. Woods, who made four bogeys Sunday and nine in the tournament, led the field in greens in regulation, hitting 58 of 72. He made 22 birdies and had no penalty shots. Despite taking 15 more putts than Molinari, he mostly avoided the issues on the greens that have plagued him at times during his comeback. Now come a few weeks of rest before he begins preparation for the PGA Championship, which has been moved to May this year and will be played at Bethpage Black in New York, the site of Woods' 2002 U.S. Open victory. He is likely to play the Wells Fargo Championship in three weeks in Charlotte, North Carolina.